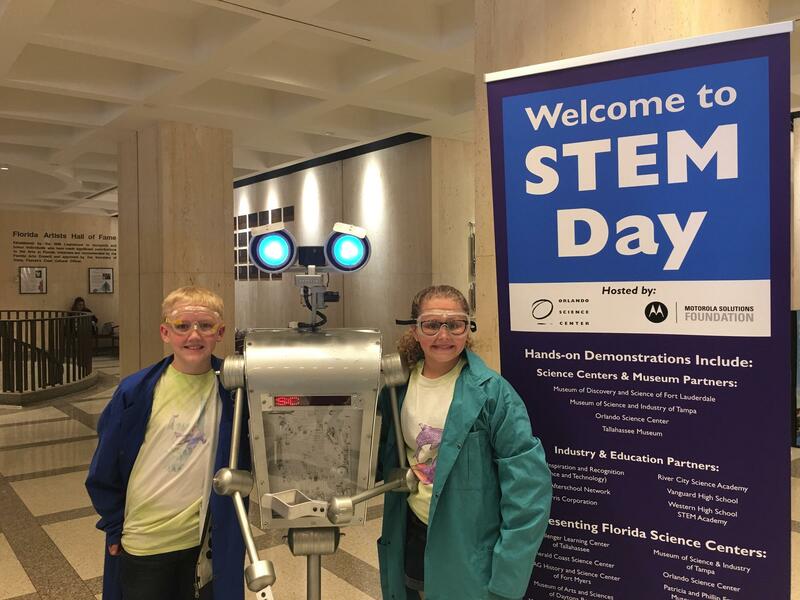 STEM Day was hosted at Florida’s State Capitol to promote science, technology, engineering and math careers. During STEM Day at Florida’s State Capitol, students are exploring STEM careers through hands-on programs. Orlando Science center, Director of Educational Operations, Scott Halpern says STEM can help students experience their own superpower by learning how humans can conduct electricity through an “energy stick” demonstration. “This is an energy stick and it has just works with, it has just a little battery in it. It’s a basic conductivity. So creating circuit, a circuit has a ground and it has a positive, and it always creates a circle. So, if I touch the middle end with one finger and I touch the middle end with another, it creates that noise and it lights up,” he says. Orlando Science Center’s Vice President of Marketing, Jeff Stanford, says science centers and museums around the state are working together to fill the pipeline for tomorrow’s tech jobs today. “Our young people need to have these skills to be successful. Beyond that, our corporations people like Motorola and Harris and big corporations like Lockheed Martin and Siemens and Boeing, they need engineers and desperately. And the next batch of engineers is going to come from today’s youth. And if they’re not excited about these concepts now, they’re not going to stay excited, engaged, encouraged to go on and get these degrees,” he says. Harrison Knight, a student at Vanguard High School in Ocala Florida says he enjoys knowing how things work. But the key to loving STEM is having a good science teacher. “Through science whether it be biology, chemistry, physics, all these different fields, I’m able to understand like the most specific or most basic level possible what exactly I’m witnessing seeing, witnessing happening around me," he says. To continue the push for a STEM-educated workforce, Tech Day is scheduled at Florida’s State Capitol Thursday.